Hello from sunny Biola University! In my continuing quest to dig into the history of conservative evangelical colleges, I’ll be working in the archives here all week. And I found a stumper in the archives this afternoon. As I strolled across campus this morning, I was thinking that everything looked pretty similar to things at my own beloved State University of New York. The students looked the same, the vibe was the same…there was nothing particularly different about the goings-on at this Christian campus compared to my own secular campus. Except, of course, for the fact that the sun was shining and flowers were blooming and the air didn’t hurt when it hit your skin. But then, I noticed something I wouldn’t be likely to see on my home campus. 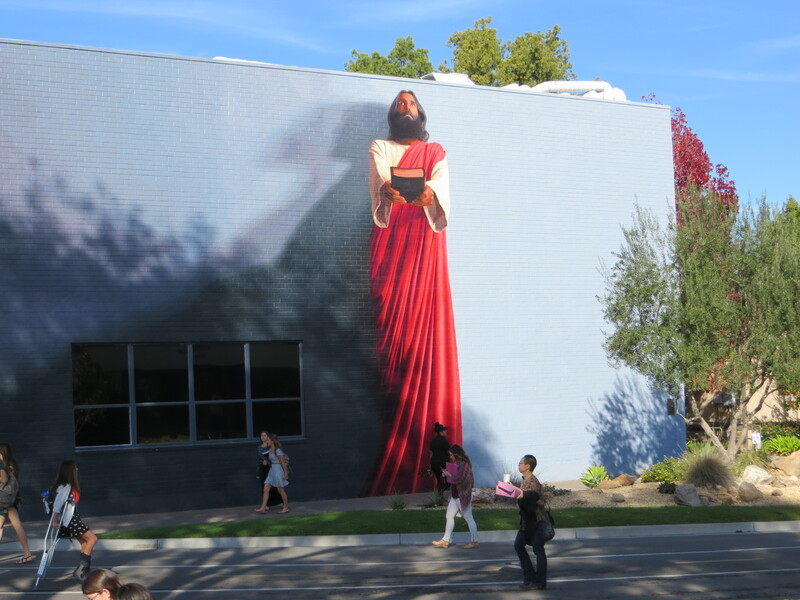 As far as I know, we don’t have any humongous Jesus paintings on our buildings. But let’s get to our archive challenge. Among the wonderful holdings here, the Biola library includes issues of the Biola student newspaper going back to 1938. And in the May 1938 edition, I saw this ad. For the life of me, I can’t figure out what it means. I looked up “swizzle,” of course, but besides a “rum swizzle” and a “swizzle stick” I couldn’t find a clue. Any suggestions? For full information, I can tell you that the Coffee-An was a lunch counter next to campus. They advertised regularly in Biola publications. A swizzle is a compounded alcoholic drink, e.g., gin or rum swizzle, but I’ve seen the term applied to compounded non-alcoholic drinks: e.g., root beer, raspberry, strawberry swizzle. That makes the most sense. Free swizzles for students. But why does the girl not have to pay when accompanied by a boy? Maybe it’s like a “mixer.” Not a drink but get together with men and women. Thinking about the year this ad was placed, I would say that this makes sense. @Adam: Chivalry? Good business (since the boy might be expected to order a drink for himself and perhaps food for both of them)? @Zina: But a mixer would have to occur at a specific time and date, which aren’t mentioned in the advertisement.